Continue the excitement of the Star Trek experience with four of the very best episodes of the series that started it all! You've met Kirk and Spock as young men on the big screen, now join them on their later journeys to the planet Vulcan, travel with them through time, and take witness as they face off in a battle to save their friendship and their very lives. 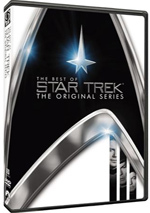 The Best of Star Trek: The Original Series includes the episodes "The City on the Edge of Forever", "The Trouble with Tribbles", "Balance of Terror", and "Amok Time"! City on the Edge of Forever: Fans hold episode in very high regard, and I can understand those opinions. The story itself is nothing spectacular, as it involves the semi-usual time-traveling and various urgent problems to be solved, but the character development of the show is what makes it stand out from the crowd. Trek was never afraid to be different than the typical sci-fi shows; most of them were all silly heroics and whiz-bang theatrics, while Trek often took a more cerebral and more ambivalent tone. As such, we often encountered shows that ended in a rather melancholy way. "City" takes that bittersweet quality to a different level and features greater moral complexity than usual. In a way, it's a precursor of the theme seen in Star Trek II, the whole "the good of the many outweighs the good of the one or the few" deal, as Kirk has to decide if one death to save many is an acceptable bargain. I won't spoil the ending, but it isn't something you see everyday on network TV, and I'm sure it stood out even more starkly in the mid-Sixties. Across the board, "City" is a well-made episode; even Shatner's usual hamminess seems toned down to a degree, and he makes Kirk more human than ever. All in all, it's a very good episode. Possibly the most famous Trek episode of them all, The Trouble With Tribbles mostly sticks with a comedic tone but adds a little menace as well through our old friends the Klingons. In this show, the crew of the Enterprise needs to protect an important load of grain. Both the Klingons and the Federation are vying for a certain planet, and the safe delivery of this space wheat will give the Feds the edge. An unusual complication arises when a trader named Cyrano Jones (Stanley Adams) pawns off a fuzzy critter named a tribble on Uhura. Soon she and the rest of the crew discover that the tribs excel at two activities: eating and breeding. Before long the entire ship is full of furry beings, and their presence creates some unusual complications. When folks think of the comedic side of Trek, �Tribbles� is the most frequently-cited example, along with 1986�s Star Trek IV. Indeed, it is a good episode, partially because it was different. Ironically, the linking of �Tribbles� with �I, Mudd� makes the humor of the former seem a little less potent; those elements don�t stand out as much when run so close with another comedy. 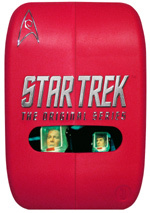 Still, the show featured some unusual plot twists, as the tribbles create a dynamic that was unique for Trek by that point in its run. �Tribbles� wasn�t quite as funny as I thought it was when I was 13, but it still provided a fun and entertaining experience. Balance of Terror marks a terrific episode and also is one in which we get to see one of the show's later-to-be-famous villainous races: the Romulans make their debut here. It's a serious cat-and-mouse piece of space warfare as the Enterprise comes head to head with their ancient foes (no points for guessing who wins). It's also one of the more exciting episodes as each side parries and thrusts. Mark Lenard - who would later return to play Spock's father - does a wonderful job as the Romulan commander; he's authoritative, regal and sympathetic all at once. The show suffers from an unnecessary subplot involving two anonymous crewmembers who want to marry - gee, hope nothing bad happens to one of them! - but otherwise is one of the series� best episodes. Amok Time provides one of the series' first looks at the personal life of Spock. As the Enterprise heads toward a crucial diplomatic reception, usually calm and rational Spock starts to act like a complete goofball; he becomes edgy and violent. It turns out Spock suffers from a Vulcan version of PMS, and if he doesn't get to his home planet ASAP, the results won't be pretty. In this episode, we learn quite a lot about Vulcan culture and see Spock within his native environment. The show is full of energy and tension. It creates some very dramatic viewing as Spock works through his nuttiness and Kirk and McCoy become involved. It's a thoroughly solid episode of Trek that stands among the series' best shows. Trivia notes: "Amok Time" saw the first use of the split-fingered Vulcan salute and offered the initial use of the phrase "live long and prosper". On a sour note, the name of Vulcan high priestess T'Pau (Celia Lovsky, then married to Peter Lorre) would later be used by a lousy Eighties band who scored with a crummy tune called "Heart and Soul" in 1987. Oh, the indignity of it all! 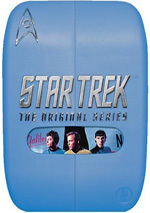 The Best of Star Trek appears in an aspect ratio of 1.33:1 on this single-sided, double-layered DVD; due to those dimensions, the image has not been enhanced for 16X9 televisions. Expect positive visuals here. Only a smidgen of softness ever materialized through the shows. Instead, they almost always looked crisp and well-defined. Jagged edges and shimmering remained minor, and edge enhancement created no significant concerns. Grain remained somewhat heavy, but that stemmed from the original prints. A few minor defects still cropped up, but these were quite minor and rarely became a distraction. Colors looked very good. �The Original Series� went with a dynamic palette, and the DVD made the tones seem lively and bright. These seemed tighter than during the prior discs, as the hues looked distinctive and full. Blacks also appeared dark and dense, while shadows looked clear and smooth. Objectively, I didn�t think the visuals were quite impressive enough to make it to �A�-level, but they easily earned a �B+�. Note that this collection featured remastered transfers that used updated computer effects. If you expect to find the �classic� old visual effects from the Sixties, you won�t get them here. As for the remixed Dolby Digital 5.1 soundtracks of all these episodes, they sounded great. Because I grade audio on an age-related curve, don't confuse the "B+" of these shows with a "B+" for a more recent production; the two don't compare. However, for material the age of Trek, these mixes really did sound fantastic. No real extras show up here. 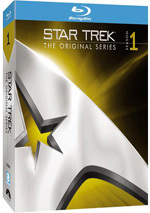 The disc opens with ads for Star Trek � The Original Series: Season One, Charmed and a few other Trek releases. These also appear in the Previews area. Some may view a title like The Best of Star Trek: The Original Series to come across as nothing more than simple marketing hyperbole. However, in this case, the claim fits, as this set includes arguably the four best episodes of The Original Series. All look and sound great, but we get no real extras. Serious fans will already own these shows, but this is a nice compilation for more casual Trekkies.